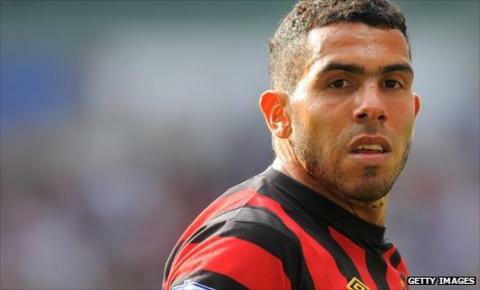 Manchester City striker Carlos Tevez says he has a "love-hate relationship" with manager Roberto Mancini. The 27-year-old also said he was staying with the Premier League club after his wife joined him in Manchester. Tevez revealed: "We had clashes with Mancini in every language but it's a love-hate relationship." City have been boosted by the return of Ivory Coast defender Kolo Toure following a six-month ban for failing a drugs test. Tevez returned to Argentina after he was left out of his country's 1-0 win over Venezuela in a friendly in India. And the striker, who has only featured as a late sub in the 3-2 win over Bolton Wanderers so far this season for City, spoke highly of Mancini. 16 May 2011 - Says he will only stay at club if solution found to "family issues"
He said: "He's fantastic, he wants to win and me too. "He told me to come to Buenos Aires to enjoy a holiday. He left me out of these first few matches because I told him I needed to get in shape. "I'm happy at City and I'm not moving from there." City team-mate Toure says he can't wait to return after a frustrating time on the sideline serving a ban for taking a diet pill, which contained a prohibited substance. The 30-year-old said: "I feel totally recharged and as fit as I've ever been in my life. "Hopefully, it will be like having a new signing because I am back and want to challenge for a first-team place. "I know it won't be easy because the team is playing so well but I'll be pushing hard for an opportunity. "I'm just so happy to be back and I will give everything I have to the team, this club and our fans. I can't wait to get going." Toure missed the last three months of the 2010-2011 campaign and watched from the stands as City won the FA Cup with a goal from his brother Yaya. "Yaya has been incredible and, as brothers, this has brought us even closer, he was always there for me," he said. "I will try and repay our amazing supporters for all their good wishes, kind words and support."